The critical link between the marksman and the rifle is the trigger. Yes, the entire "fire control group" (trigger, hammer, disconnector/sear, associated pins and springs) can affect accuracy. The shooter's ability to learn and perform proper trigger manipulation/control has a definite impact on accuracy as well. Without proper trigger squeeze and accurate shooting skills, most weapons are more accurate in and of themselves than the individual employing them. 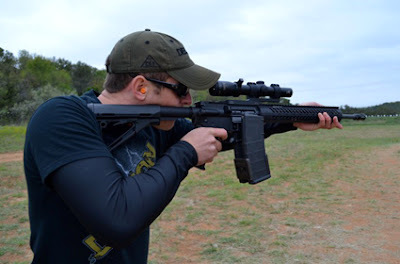 However, once these skills are learned and consistently performed, a synergy between an accurate rifle and a trained marksman can result in an impressive degree of accuracy, even from most "stock" factory firearms. The topic of trigger control and shooting mechanics/skills will be saved for a future blog post...this one will provide some information about simple trigger upgrades that can offer a benefit for some shooting applications. When upgraded triggers became available, they were mostly designed for, marketed to, and used by those involved in shooting sports like target competitions or other applications where a higher degree of focus is placed on extreme accuracy. Everyone wants an accurate weapon and the ability to shoot accurately-but these are shooters desiring to achieve truly miniscule shot groups because that is what their application required. In recent years, the technology and techniques that offered benefits in the "precision shooting arena" has been recognized to offer benefits to other shooting applications, such as 3-gun competitions (where speed is a more important factor), personal defense/training/combat, and hunting. Upgraded triggers provide a crisp break without the typical weight, travel, and sometimes "gritty" feeling of a standard, mil-spec, stock trigger. An upgraded trigger is NO substitute for proper shooting technique/trigger manipulation, but it has the ability to greatly benefit a shooter that has these learned skills, and it can even make it a bit more simple for an individual new to the sport to learn proper technique and enjoy success. Upgraded triggers usually come in either a single stage or two stage model. A standard, "mil spec" trigger is a single stage type. The single stage upgrades simply offer a much smoother and lighter pull, often with a reduced length of travel and a dependable and consistent reset. Two stage triggers have a longer initial "take-up" (the first stage), followed by a clean, crisp, and light break (the second stage). Knowing when this break occurs becomes very intuitive to learn and expect-which can be a good thing, provided the shooter has no bad habits and understands proper shooting technique. Two stage triggers once were primarily used by shooters who were involved in precision applications where this style of trigger offered the greatest benefit; the accepted idea among those in the shooting community was that they were excellent for this type of shooting, but not so much for those applications where speed may be necessary. Recently, this idea has been challenged by successful performance in other shooting sports and situations and it has become more accepted that the two stage trigger can benefit almost any shooter and shooting style or application. I would have to agree. There are quite a few manufacturers who produce great trigger upgrades in both styles. Del-Ton offers a few examples in a varied price range for any shooter's application and budget. The Knight's Armament Two Stage Trigger is amazingly engineered and very adjustable for weight and travel, but is also one of the most expensive due to these features. JP Enterprises makes some of the best feeling and application specific upgraded fire control groups available. DTI offers a few different versions of their single stage trigger upgrades. At roughly the same price point is the Rock River Arms Two Stage Trigger that has a loyal following among those who prefer this trigger design. Del-Ton also offers ﻿﻿﻿﻿a DTI Two Stage Trigger. It is most similar in operation and design to the Rock River Arms model, but retails for a bit less. The blue highlighted text areas above will provide a link to each model on our website. Click here to link to the Midway USA product page and read reviews on the DTI Two Stage Trigger. Installation of any of these is fairly easy, especially with the multitude of online videos and tutorials that can be found with a search engine query. Thanks for reading our blog. If you have any questions about the upgrade triggers we offer at DTI, or how they may work in your AR-15 rifle platform and increase your shooting accuracy and enjoyment, please contact us.